A nice collection of well-sorted puzzles, especially for players of average strength (Elo 1600-2000). Palliser has not graded them in difficulty, only in themes, which makes solving them more interesting. All top chess players agree that to keep your tactical muscles in shape it's imperative to continue training, and the easiest and most fun way to do this is by performing tactical exercises. Even solving a few puzzles for ten minutes each day can be of the utmost benefit for the aspiring player. But where can one find the required number of suitable puzzles to satisfy this demand? 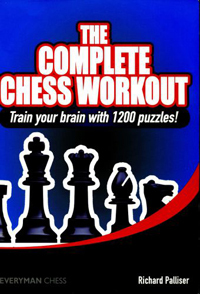 Look no further than The Complete Chess Workout. In this book, tactics expert Richard Palliser presents the reader with a massive 1200 puzzles, all checked for accuracy by the latest computer engines. There is something for players of all levels here: a huge number of basic tactics - forks, pins, skewers and checkmates - to appeal to beginners and improvers, and several brain-teasers that will tax even the strongest of players. Palliser has meticulously collected puzzles from practical play in recent years - a large percentage of the exercises here will be completely new to most readers. All the important tactical themes are covered, while there are special sections on opening traps and endgames. Work your way through this book, and your opponents will soon be on the receiving end of your increased tactical powers! How I miss you !! What happiness to see you !! Great post! Thanks for Sharing jiri! !